Is it time for your to buy new Canon NP-1550 printer toner? In due course your Canon NP-1550 will run out of printer toner, and when it finally happens you'll learn that fresh Canon NP-1550 toner is generally seriously expensive. However, you don't have to fret about shelling out the steep costs you'll discover on the high street because right here at Cartridge Save you can order all the Canon NP 1550 cartridges you will need at super competitive prices. Start to save cash by ordering online with Cartridge Save! Don't overpay for the NP-1550 original cartridge or NP-1550 compatible toner on the high street when it is easy to save a pile of money shopping online with Cartridge Save. You enjoy total satisfaction when you purchase your NP1550 toner cartridges from us seeing as each one is covered by a no quibble 30 day money back guarantee. Don't forget that every order also has free delivery, mostly arriving at your doorstep on the following working day! The Canon NP-1550 laser printer is a reliable standalone copy machine intended for small businesses. This device can deliver decent-quality text documents and greyscale images and graphics. It can print on A3 media and can copy 3D objects and books. The Canon NP-1550 offers both manual and automatic copy density adjustment and it can continuously copy up to 99 pages. The Canon NP1550 laser copier has slow copy speed. This model comes with a small control panel and a flatbed scanner that can handle objects as heavy as 2 kg. The Canon NP-1550 printer measures 697 x 617 x 391 mm and weighs 50.6 kg. It can handle 100 sheets at a time but optional trays are available. Copy speed can go as fast as 15 copies per minute for A4 media and 9 cpm for A3. The Canon NP-1550 photocopier has a wait time of 75 seconds and a first copy out time of 9.4 seconds. Workers favour the Canon NP-1550 black and white copier as it has flexible media handling and offers good output. This reliable device is very easy to use and it has a small footprint. Low maintenance is required and the Canon NP 1550 mono laser printer uses long-lasting consumables. Black Canon NP1550 cartridges are available in a multipack which helps buyers to save time and money when it comes to replacing toner. This device could be more convenient if it had faster copy speed. The NP-1550 is outdated and does not offer a standard automatic document feeder and a duplexer - double-sided printing can only be done manually. PC connectivity is not offered, either. 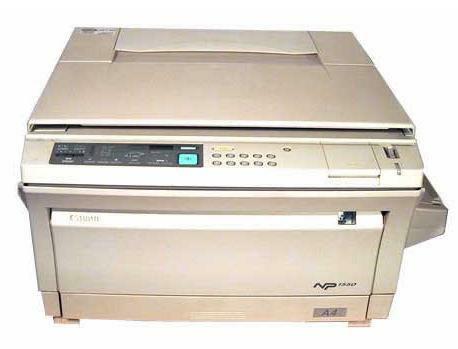 The Canon NP-1550 copier is no longer produced and has been replaced by new models.